WHY the red unicycle was left in the Seward, Alaska, dump and what inspired George Peck's wife, Carol, to bring it home are both unclear. "I'm a salvager and recycler," is all she will say. "She's a dump rat," Peck says. Carol put the unicycle in the garage, and Peck found it there. This was almost fourteen years ago. His life hasn't been the same since. "I glom on to things," Peck says. "He gets obsessed," Carol says. Peck taught himself to ride the red unicycle -- no books, no instructors. He practiced daily for more than a month before he could wobble up and down his driveway. Then he attempted to take the unicycle onto the roads. Riding a unicycle is as precarious as it looks -- the "cone of balance," as Peck calls it, is extraordinarily precise. A pebble can be enough to put you on your back. So can a patch of sand or a gust of wind or a crack in the pavement. This may be why the red cycle was tossed into the dump: Seward is possibly the worst spot on the planet in which to ride a unicycle. The place is all sand and gusts and cracks, not to mention ice and snow and logs and boulders and mountains. Peck learned to ride his unicycle under all conditions. He discovered how to make the cycle hop, and he honed the skill until he could pop over logs two feet in diameter. He figured out how to power through boulder fields, how to jump up and over picnic tables, how to turn in ankle-deep mud. He became skilled at riding in dried-out riverbeds, across frozen lakes, up mountain trails, and through wind-crusted snow. This is clearly not what unicycles were designed to do. When the red unicycle fell apart, Peck drove to Anchorage and bought a new one. When that broke, he ordered another. After a dozen more were destroyed, he began designing his own. 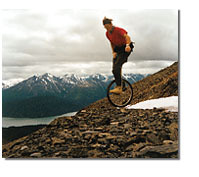 For almost a decade and a half, no matter the weather, Peck has gone mountain unicycling nearly every day -- twice a day most weekends -- in and around Seward. People in town are used to seeing him. He has ridden the shoreline so many times that he notices if a rock has been moved. Seward sits on Resurrection Bay, on the eastern edge of the Kenai Peninsula. It is separated from Anchorage by 125 miles of glaciated mountains and sprawling icefields. The town is so remote -- a Galápagos island of sorts -- that something odd or fantastic can develop there and never be discovered by anyone beyond the city limits. Until three years ago, when he attended the International Unicycle Convention in Minneapolis, Peck was completely unknown in the unicycling community. At the meet he learned of a handful of other mountain unicyclists. He found out that his sport had not only other participants but also a name -- "muni," short for "mountain unicycling" (a name, Peck feels, that is a little too cute; he prefers "rough-terrain cycling"). Later, through a unicycling newsletter, he read of plans for an inaugural muni convention. Last October he flew to Sacramento for the first annual California Mountain Unicycle Weekend. Thirty-five of the best rough-terrain unicyclists in North America came to show off their skills. No one was half as good as Peck. He is now widely viewed as the best mountain unicyclist in the world. He is credited with helping to invent the sport, and the cycles he has designed are probably the sturdiest and lightest unicycles ever built. He is riding rougher terrain every month. 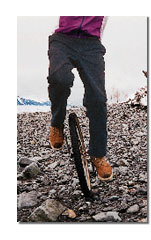 And he is almost certainly the world's oldest mountain unicyclist: Peck is fifty-six. CAROL and George Peck and their two children, Kristopher, twelve, and Katy, seven, live in a small brown house two blocks from the center of town. Attracted to Alaska's frontier image, Peck moved to the state in 1974, after a stint in Nepal with the Peace Corps and almost ten years in the University of Idaho's graduate schools, where he earned degrees in physics, law, and teaching. He came to Seward to take the job of magistrate, a position he still holds. He met Carol Griswold in 1981. The inside of their house, especially during the long Alaska winter, is a scene of unmitigated chaos. Peaches and Boomer, a pair of parakeets, like to dive-bomb visitors' heads. Berry and Jessie, two Labrador retrievers, wrestle in the kitchen. Katy prefers roller skates to sneakers, and Kristopher wouldn't be caught dead without his skateboard. The living room contains three unicycles, a small trampoline, a basketball net, an electric keyboard, two acoustic guitars, two fiddles (Carol and George play in a local folk band), an indoor garden, an eclectic library (one shelf devoted to entomology, another to dog training), a general scattering of children's toys, several of Carol's junkyard furniture discoveries, a hamster cage, a fish tank, and a midden of unicycle parts. "George has been a teenager for forty years," Carol says. This is only partly true. When Peck is in his courtroom, facing the daily litany of drunk-driving and domestic-violence cases, he is fifty-six years old. When he is awake at two in the morning, mulling over the physics of wheel diameter and axle size, he is fifty-six. When he is riding, he is seventeen -- though he doesn't use swearwords. When he falls, he says things like "Gargle!" and "Yug!" and "These shoes are explosively decoupling with the pedals, and that's disconcerting." Peck is a little over six feet tall and about as thin as a fence post. He has the air of a mad scientist. His hair appears to be an assemblage of cowlicks. He is profoundly nearsighted, and wears round gold-framed glasses. A housewide search for his car keys is almost a daily event. He eats dinner as if a cash prize were to be awarded to the first finisher. His unicycle is built of top-quality titanium and tempered aluminum parts, special-ordered from a custom manufacturer, but Peck often rides wearing faded jeans, a stained sweatshirt, and leather work boots. On the front of the family's washing machine, using word magnets, Katy has assembled a succinct ode to her father: DAD IS FUNNY. On weekend days Peck takes his first ride soon after sunrise, usually with the dogs. He rides along Resurrection Bay, the sharp summits of the Chugach Mountains forming a backdrop. He pedals in fits and starts: a powerful flurry to ascend a flat-topped rock, an immediate ninety-degree turn on the top, a momentary pause to consider the drop-off, and a careful hop down to the sand. His arms provide counterbalance, waving in controlled, tai-chi-style movements. The tip of his tongue flits in and out. In rough-terrain cycling, top speed, even going downhill, is about six miles an hour. "It's not exhilarating," Peck says, "but a series of little joys." He cuts through a puddle, cracking a thin film of ice, and chugs up a dirty snowbank. He falls twice, gracefully, and climbs back on. A UNICYCLE is both more and less than half a bicycle. It has a solid hub and lacks any gears, meaning that one rotation of the pedals produces one rotation of the wheel. This is called direct drive, and is the reason a unicycle is limited to low speeds. You can't coast, but you can ride backward. "Unicycling is intrinsically a slow-motion event," Peck says. "It is more about rhythm and mental dexterity than about strength -- it has more in common, I feel, with a chess match or a Bach concerto than with any extreme sport. And it's actually very safe -- far safer than bicycling. I've never had an injury so bad I couldn't ride the next day. Much of the thrill, really, is in pondering the ergonomical conundrums. Torque. Pedal separation. Crank-arm length. Spokes. You need the cycle to be sturdy, and you need it to be light and maneuverable. And everything has to be balanced on one tiny axle. It's nearly insolvable. The five best riders I met at the California weekend were a physicist, a mathematician, a neurophysiologist, a computer analyst, and an Intel executive." He says this as he rides. If a visitor jogs alongside him (the pace is perfect), Peck will furnish an hour-long disquisition. He will expound on Alaskan geology. He will talk about unicycling up street curbs, and about the appropriate pedal positions for optimum torque, and about the time he beat a pair of bicyclists up the steep Crown Point Mine trail. He will insist that it is possible to unicycle nearly any surface that can be walked, provided one has the right unicycle. Peck estimates that he has spent $2,000 on his current unicycle -- but he is still unsatisfied. About once a week he visits Ron Henderlong, who helps to improve his unicycles. Henderlong Enterprises is a welding shop located in a garage not far from Peck's house. Henderlong is shorter than Peck but probably twice his weight. The lower half of Henderlong's face is devoted to a terrific beard and moustache, between which is inserted a steady stream of Marlboros. He wears a patch over his right eye. On the floor of his garage is a masking-tape outline of a body, with a wrenchlike shape stenciled in the body's right hand. "That's the last guy who went into my toolbox without asking," he says. According to Peck, Henderlong is a genius with hot-rod engines and cutting-edge unicycles. He customized Peck's shock-absorbing seat post. The two men can talk shop for hours; Peck always leaves with a new idea or two. "I'm tired of giving him six-packs of beer," Peck says, "but he won't take any money." If you really want to make Peck mad, ask him if he is a clown. "That word makes my teeth set right at the top," he says. The image of unicycling, Peck fears, automatically brings clowns to mind. He has been asked more than once if he works for a circus. Some have wondered if he entertains at birthday parties. One person questioned whether riding a unicycle is an appropriate activity for a judge. "Unicycling is at the very bottom of the respectability curve," Peck says. "Nobody would accuse me of being irresponsible if I were a skier or a rollerblader. I'm trying to get as far away from clowns as I possibly can." He tries not to use the term "unicycle" anymore: too circusy. He prefers to call what he rides a cycle. SOMETIMES Peck thinks that if he can only free his sport from the clown associations, nothing will stop rough-terrain cycling from becoming the next big thing. He likes to point out that unicycling has been around longer than bicycling: one of the original cycles, the "penny-farthing" with the giant front rim, was little more than a unicycle with a training wheel. Combine modern materials with the old idea, toss in a few log jumps, and rough-terrain cycling should be Olympics-bound: "Bored teenagers in California will be hopping their cycles over their Volkswagens." Then he thinks better of it. "Cycling is safe and slow," he says, "and safe and slow are unhip. People want sports that are like video games. Maybe that's why there are so few riders." Peck estimates that there are perhaps 200 muni participants worldwide, including a club based in England and a Frenchman, Thierry Bouche, who has unicycled down a 20,000-foot peak in South America. No company in the United States sells mountain unicycles (with so few riders, there's no incentive to manufacture them), and without good cycles available there won't be many more converts. The sport is nearly certain to stay tiny. And in Seward, at least, it is likely to remain a solitary pursuit. Peck hasn't let this discourage him. Recently his cycling entered an entirely new phase. He acquired a contraption called an ultimate wheel, which is a unicycle without a seat -- just a wheel and two pedals. It looks impossible to ride, even when Peck is riding it. It took a month of intense ultimate-wheel training, combined with the skills of years of unicycling, for him to balance on the thing. He says he's glommed on to it. Carol says it's a new level of obsession. He and Henderlong are sure to re-equip it with sturdier parts. And Peck is already riding it up and down Alaska's mountains. Photographs: George Peck, Kristopher Peck. The Atlantic Monthly; April 1997; Rough-Terrain Unicycling; Volume 279, No. 4; pages 109-112.